Let me begin by saying I am well aware of how hard it is to have a winning season let alone win a championship. No matter the sport or level of competition, there is only going to be one team left standing. There is only going to be one team holding that trophy at the end of the year. So I am not suggesting that this is a solution for everyone to acquire some new hardware to display, but I do have some thoughts on the matter. Let’s take football for example. Every year, thirty-two NFL head coaches stand in front of their teams and say that their goal is to win the Super Bowl. Every. Single. Coach. Every. Single. Year. Yet, there are truthfully only a handful of teams that are even worthy of such a lofty goal. The same holds true collectively in the NCAA, for that matter. You really think every head coach in the NFL believes they can actually win the Super Bowl? If you do – you might be more nonsensical than the coaches! There is a common theme here, though. And that common theme is leadership. Think about this: How does Nick Saban continually get the top recruits in the country to come to Alabama every year — oftentimes recruits that will be playing the same position? How does he attract these selfish, spoiled, instant-gratification-seeking Millennials who are all about themselves? (Sarcasm) And once in an Alabama uniform, how does he get them to buy-in to a common goal in the greatest team sport ever created? Nick Saban and the Alabama Crimson Tide are in the hunt every year. They are in the hunt EVERY year for the National Championship. And while there are no guarantees in life, the only way you can win a championship is to put yourself in a position to compete. Nick Saban and his team have maintained that position year after year. Believe me, this isn’t accidental. This isn’t some magic formula or analytics problem. It is, in my opinion, a direct refection of leadership. Yes. There are external factors that play a role, but the common denominator is leadership. Let’s bring this example closer to home. Why are the Pittsburgh Steelers relevant every year? The answer: Because of their leadership. Sure they haven’t won a championship in a of couple years and have missed the playoffs a of couple times along the way (sorry for the reminder Steelers fans), but the Cleveland Browns have never even competed in the Super Bowl. What is the common denominator there? The answer: Poor leadership. This isn’t rocket science. But the hard fact to accept is that we live in a world that is constantly changing. Technology has sped up nearly every process and it has really put an emphasis on the constant evolution of society. No longer is it enough to just have thirty years of experience. Don’t get me wrong, it surely helps, but there are things that have no precedent in today’s workforce and this seems to be problematic. There is a real challenge of balancing the old with the new. And the answer doesn’t lie in a quick-fix skinny pill. Think about a chain — the kind of chain you can buy at Home Depot. You have these small, thin, metal chains you can buy to lock your tool shed and you have these large, heavy-duty, metal chains that are used for industrial-type things. They all have a place, right? I want you to imagine walking into Home Depot and buying a couple inches of each kind of chain because you need them for a project. Now, I want you to think about these chains. Each of these chains have links. Imagine these links as categories or tools that we are focusing on in the workplace like education, training, people development, and updated technology. These categories/tools simply strengthen the individual links of the chain, but you still have this missing link that connects the small and large chains to one another. And that link is leadership. This missing link isn’t a transactional purchase. This missing link is constantly being cultivated and developed. To bring this back around to the aforementioned example of championship caliber teams, this missing link is the differentiator between teams that simply talk about winning a championship and others that are willing to make it happen. Leadership is the most important element of any business, team, or organization. It’s not an “either/or” decision. It’s an “AND” decision. 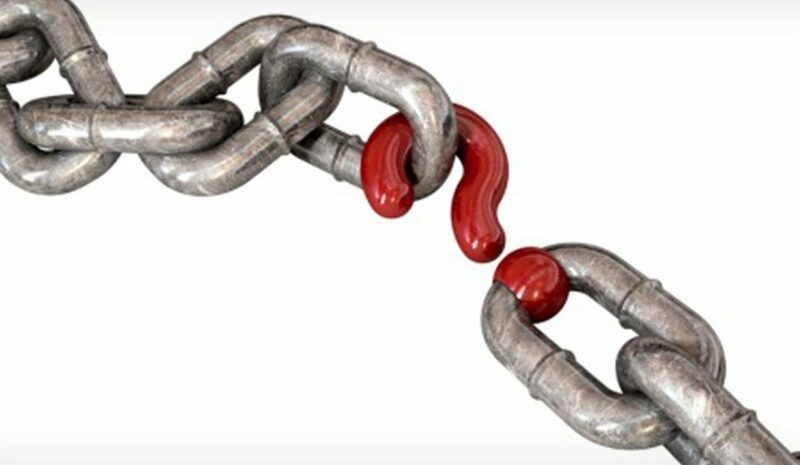 It is of the utmost importance for every business/team/organization to strengthen their chains while also developing the missing link that ties them all together: Leadership. All of these chains craft a united group and this group has an exponentially better chance of success than a bunch of individual units. You are only as strong as your weakest link. But you have absolutely no chance of achieving success if these chains aren’t connected with strong, deliberate links. How are you developing your leadership link?